You’ve seen the shape before: a turbine vent with a slatted metal dome, swirling in the wind on a rooftop. For most people, there’s nothing remarkable about it, no other purpose but that for which it was made. But Robert Nicholas has a way of seeing possibilities that others miss. The Asheville-based lighting designer transforms the most unlikely architectural and industrial elements into light fixtures that are stylish and edgy. 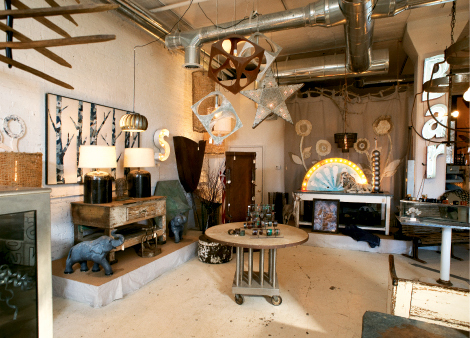 He fitted that roof vent with bulbs, and now it and other luminescent pieces—including one crafted from remnants of a European carousel and another incorporating machinery from a Georgia peanut-processing plant—hang at Splurge, the River Arts District showroom and antiques gallery Robert runs with his wife, Rebecca. A self-taught designer, Robert spent much of his career as a youth minister and camp counselor, work that first brought him to Western North Carolina. His yard- and estate-sale hobby, or “obsession,” as he calls it, sparked his interest in design. “I could spend all day, every day looking for stuff,” he says, “but I don’t like common things.” For years, he and Rebecca would hit every weekend sale they could, and Robert gravitated toward architectural salvage pieces. He resold some, but found himself wanting to make things with them. So he got a set of woodworking tools, transformed a variety of the reclaimed materials into lamps, and sold them through local designers. Scale is another important element of his work: Many of his pieces are oversized, suitable for soaring ceilings and cavernous entryways. As a result, he’s caught the attention of interior designers working in commercial spaces, from Miami’s design-oriented Delano Hotel to a resort in Wrightsville Beach to Asheville’s Storm Rhum Bar & Bistro, where the lighting is crucial to the overall atmosphere. He also works with homeowners to create custom designs. “I like pieces that evoke a feeling,” Robert says. More often than not, that feeling is tinged with nostalgia—a sense of value in something once abandoned.